“Exploring the applications of various valuation methods for Australian coastal climate adaptation”, National Climate Change Adaptation Research Facility ($80,000), with Professor Stefan Trück and Dr Supriya Mathews. “Early-Warning Systems and Managing Systemic Risks using Real-Time Financial and Business Conditions Indicators”, Centre for International Finance and Regulation Research Grant, 2012 – 2014 ($537,000), with Professor Jeffrey Sheen and Professor Stefan Trück. “Development of an Operational Risk Capital Model”, Research Grant funded by the Commonwealth Bank of Australia and Macquarie University, Jan 2012 - Dec 2012 (AUD $99,000), with Professor Piet de Jong and Professor Stefan Trück. “Modelling optimal adaptation strategies in response to climate change by local governments”, Macquarie University New Staff Grant ($19,910), Jan 2010 - Dec 2010. Postdoctoral Fellowship at the Faculty of Business and Economics, Macquarie University. 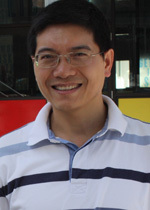 Dr Truong's research interest is focused on risk quantification and investment analysis. He has experience in quantifying catatrosphic risk introduced by climate change, operational risk faced by banks and systematic risk in the financial and economic system. He has published in the area of real option analysis for irrigation sector and long run policy analysis for irrigation water management. Dr Truong has also conducted research with the Commonwealth Bank of Australia in the area of operational risk and the Asian Development Bank in systemic risk. Truong, C., Trück, S. and Mathew S. (2017). Managing Risks from Climate Impacted Hazards - The Value of Investment Flexibility under Uncertainty. European Journal of Operational Research (A* ABDC List, Impact factor = 3.297) (*). Truong, C. and Trück, S., 2017. Discounting the distant future - Data on Australian discount rates estimated by a stochastic interest rate model. Data in Brief, 11, pp.127-130 (*). Truong, C. and Trück, S. (2016). It's not now or never: Implications of Investment Timing and Risk Aversion on Climate Adaptation to Extreme Events, European Journal of Operational Research (A* ABDC List, Impact factor = 3.297) (*). Truong, C. and Trück, S. (2016). The principal-agent problem in coastal development: response to Mills et al. Conservation Biology (Impact factor = 4.27) (*). Truong, C.H. (2014). A Two Factor Model for Water Prices and Its Implications for Evaluating Real Options and Other Water Price Derivatives, Canadian Journal of Agricultural Economics (A ABDC List, Impact factor = 1.29) (*). Truong, C.H. and Drynan R. (2013). Capacity sharing enhances efficiency in water markets involving storage, Agricultural Water Management (Impact factor = 2.60) (*). Truong, C.H. (2012). An analysis of Storage Capacity Reallocation Impacts on the Irrigation Sector, Environmental and Resource Economics 51, pp.141-159 (A ABDC List, Impact factor = 1.67) (*). Truong, C.H. and Trück, S. (2010). Evaluation of Investment Options Mitigating Catastrophic Losses under the Impacts of Climate Change, Environmental Economics 1, pp.111-117 (*). Handika, R., Truong, C., Trueck, S., and Weron, R. (2014). Modelling price spikes in electricity markets - the impact of load, weather and capacity. In M. Prokopczuk (Ed) Energy Pricing Models: Recent Advances, New York: Palgrave Macmillan. Last Updated: 2018-01-24 22:40:32 by Angela Chow.